I don’t think anything could be further from the truth. Google is going to put its marketing muscle behind this in a very big way to ensure that consumer awareness persists long after today’s launch. Granted, the company says it is favoring an online strategy as opposed to television for its campaigns (which is why the analyst quoted above doubted its chances), but Google can still plaster the Nexus One all over the web. It’s already started. Visit the YouTube homepage right now, and you’ll see a fairly prominent link to the Nexus One official YouTube Channel, which is loaded with how-to guides and video walkthroughs. Google is also running quite a few AdWords ads for keywords like “smartphones”, “phone”, “maps”, and “android”. That’s not hugely surprising, though it is worth pointing out that Google is purchasing ads that compete directly against some of its partners. I suspect this is only the beginning. 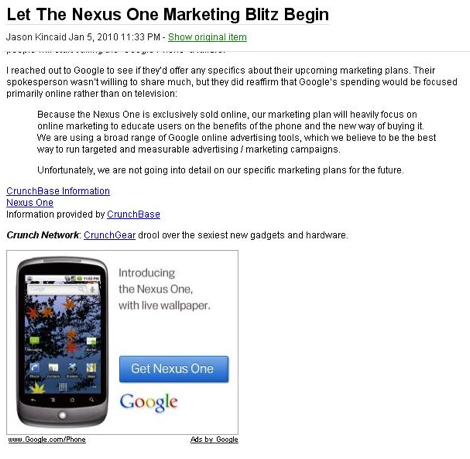 Don’t be surprised if we see ads for the Nexus One on Google’s famously spartan homepage (this would be a very rare move for the company, but it set a precedent with the Droid launch). Likewise, we’ll probably see small ads pop up on various Google products, the same way the company often prompts users to try out Chrome. And there will likely be a big push on third party publisher sites. Google has a lot riding on this launch. Sure, it would be nice for the phone to be a popular device in its own right. But, as many have pointed out, it’s the disruptive distribution model that’s going to have the biggest impact down the line. 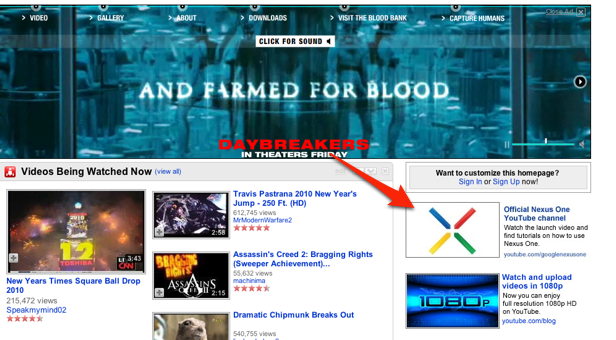 Google needs to show that this new online distribution model is something that people are willing to actually use. As it stands now, that’s going to be a bit of a challenge. Buying a cell phone online will be a pretty foreign experience to most people (at least in the United States). That isn’t to say it’s a difficult experience. It’s just different. And it’s going to require plenty of ads and hand holding to get people used to the process, because they won’t have a sales rep standing next to them to help. Also, keep in mind that Verizon reportedly spent $100 million to market the Droid in 2009. I doubt Google anticipates that the Nexus One will actually beat Droid in sales in the short term (given Verizon’s thousands of retail stores versus Google’s online-only storefront that would be very difficult indeed). But if three months down the line the Nexus One still represents a very tiny sliver of Android’s market share, you can be sure people will start calling the ‘Google Phone’ a failure. Because the Nexus One is exclusively sold online, our marketing plan will heavily focus on online marketing to educate users on the benefits of the phone and the new way of buying it. We are using a broad range of Google online advertising tools, which we believe to be the best way to run targeted and measurable advertising / marketing campaigns. Unfortunately, we are not going into detail on our specific marketing plans for the future.